BREEZE Litter Pellets are cat-friendly and non-tracking. Unlike traditional clay litter, BREEZE uses specially-designed Litter Pellets that are 99.9% dust free. 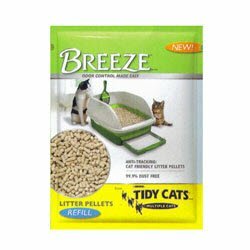 These BREEZE™ Litter Pellets allow urine to pass through to the odor-controlling BREEZE Cat Pad underneath, while leaving solid waste on top for quick, easy removal. Enjoy carefree living without the mess of fine granules and dust. Put up the broom, and make clean up a BREEZE.